This comprehensive tourist map includes the following: Detailed highway system including major four wheel drive and gravel roads, Distances between major communities, All Major rest areas along highways, All communities in BC with population symbols, All major parks with an accompanying Facilities Index, All Ferries, All Passenger Railways, All Major Airports and Harbour Landings, All Customs / Border Crossings, All Major Mountain Passes, Time Zones, Distance Chart, Parks Facilities Index, Detailed insets of Greater Vancouver, Greater Victoria and Gulf Islands, Yukon / Alaska. A comprehensive guide of the Campbell River and Courtenay area including Comox. The map also includes Block Numbers, Schools, Parks, Golf Courses, Cemeteries, Hospitals, Community Centres, Police, Firehalls, Campsites, Boat Launches, Marinas, Wineries, Hiking Trails, Logging Roads etc. A comprehensive guide of the Duncan and Gulf Islands area including the communities of: Ladysmith, Chemainus, Crofton, North Cowichan, Maple Bay, Lake Cowichan, Youbou, Honeymoon Bay, Mesachie Lake, Cowicahn Bay, Cobble Hill, Shawnigan Lake and Mill Bay. The map also includes Block Numbers, Schools, Parks, Golf Courses, Cemeteries, Hospitals, Community Centres, Police, Firehalls, Campsites, Boat Launches, Marinas, Wineries, Hiking Trails, Logging Roads etc. New 2011-2012 Edition is out now. Includes, Nanaimo, Parksville, Qualicum Beach, Hornby Island, Denman Island, Lantzville, Cedar, Yellow Point, Ladysmith, French Creek, Nanoose Bay and all points in between. Victoria, Oak Bay, Saanich, Esquimalt, Sidney, Central & North Saanich, Highlands, View Royal, Colwood, Langford, Metchosin, Sooke, Port Renfrew, Saltspring Island, Galiano Island, Mayne Island, Saturna Island, Pender Island, Duncan, Maple Bay, Shawnigan Lake, Mill Bay, Cobble Hill, Cowichan Bay, Chemainus, Saltair, Crofton, Lake Cowichan and Ladysmith. 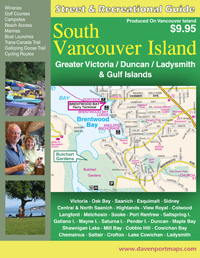 Includes maps of: Vancouver Island, The Pacific Northwest, Golf Courses, Wineries, Downtown Victoria, University of Victoria. Also Includes: Victoria Real Estate Neighbourhood Boundaries, Marinas, Boat Launches, RV Sites, Trans Canada Trail, Galloping Goose & Lochside Trails, Hiking Trails, Block Numbers, Shopping Centres, Parks, Golf Courses, Fire Halls, Cemeteries, Libraries, Schools, Hospitals, Community Centres, Recreation Centres, Points of Interest, Police Stations, Visitor Centres. Vancouver Island and Sunshine Coast. 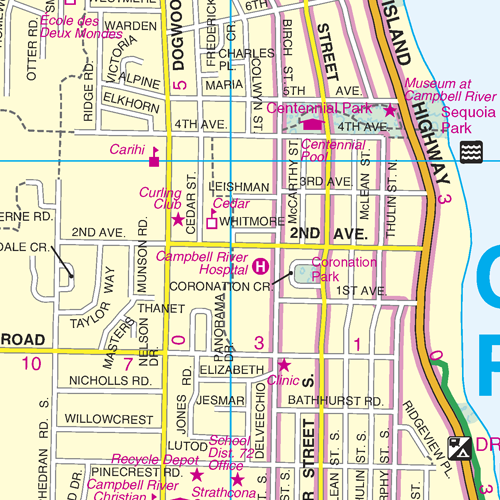 Includes street level insets for Victoria, Sidney, Duncan, Chemainus, Ladysmith, Nanaimo, Parksville, Qualicum Beach, Courtenay, Comox, Port Alberni, Campbell River, Port Mcneil and Port Hardy. Includes Insets for Enlarged South Vancouver Island and Whistler. 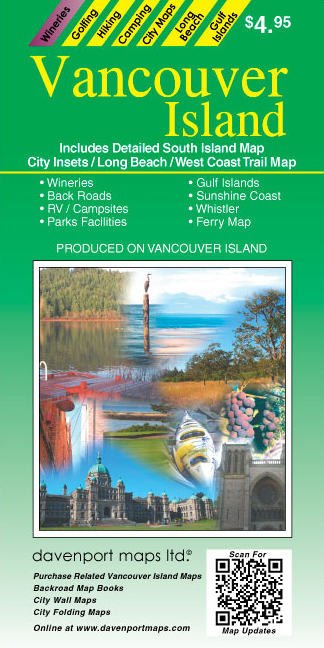 All Ferry Connections to and from Vancouver Island, Pacific Rim National Park, West Coast Trail, Juan de Fuca Trail. Shows all parks with recreation facilities listed at each park, Campsites-Provincial / Forestry, City Index, Distance Chart. New 2013 Edition is out now. Includes Victoria, Oak Bay, Saanich, Central Saanich, North Saanich, Sidney, View Royal, Esquimalt, Colwood, Langford, Metchosin and Sooke, Block Numbers, Schools, Parks, Golf Courses, Cemeteries, Hospitals, Community Centres, Police, Firehalls etc.